Jawatan Kosong 2018 di S P Setia Berhad | Permohonan adalah dipelawa daripada Warganegara Malaysia yang berkelayakan dan berumur tidak kurang dari 18 tahun pada tarikh tutup iklan ditawarkan untuk memohon jawatan kosong di S P Setia Berhad. S P Setia has established a strong brand presence in Malaysia as well as overseas, a brand synonymous with quality, reliability and value creation. 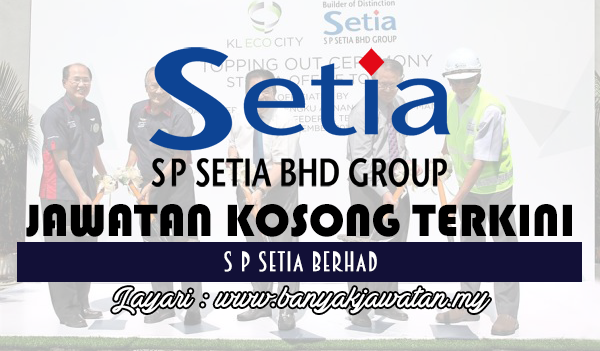 S P Setia is also at the forefront of branding in the property industry in Malaysia, being the pioneer in coining the renowned LiveLearnWorkPlay concept which is trademarked by the company as well as ECO philosophy in all S P Setia’s developments, making it a highly regarded brand in the industry. Our quality products as well as our sensitivity to our customers' needs and aspirations have also contributed to S P Setia's sterling reputation as a property developer. 0 Response to "Jawatan Kosong di S P Setia Berhad - 6 April 2018"